My first northern dish for MFF Kedah Perlis. Easy to do but needs a long time to cook. 4 hours of slowly simmering to bring out the best flavours in the broth. The broth itself is very delicious, flavourful enough to be taken on its own. According to Rinnchan, Nasi daging is often served at weddings and other occasions for entertaining due to its ease in preparation. Just boil and cook, that’s pretty easy, in terms for Malay cuisine, of which usually involves lots of grinding, sautéing, simmering.. and not to mention manual coconut milk extracting from grated coconut back in those days when store bought fresh coconut milk was unheard of. Although there is nasi daging in Penang too, but the spices used are different. There's more curry-feel for the Penang version. 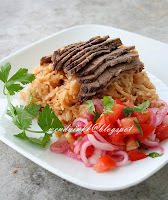 The kuah asam tomato is the perfect match for this rice. With its tangy spicy notes, it adds uumph to the mellow nasi daging. 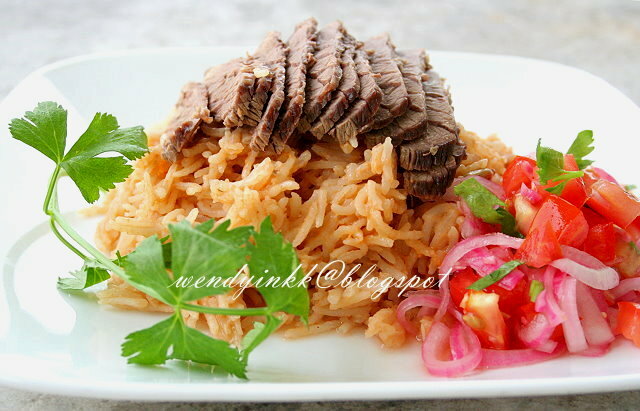 And the raw tomatoes brings a fresh taste to the strong flavours of beef, spices, and milk infused rice. *if you do not wish to use this list of spices, buy a Sup Tulang spice pouch. It has similar spices, except that the pouch has coriander, minus the cumin. 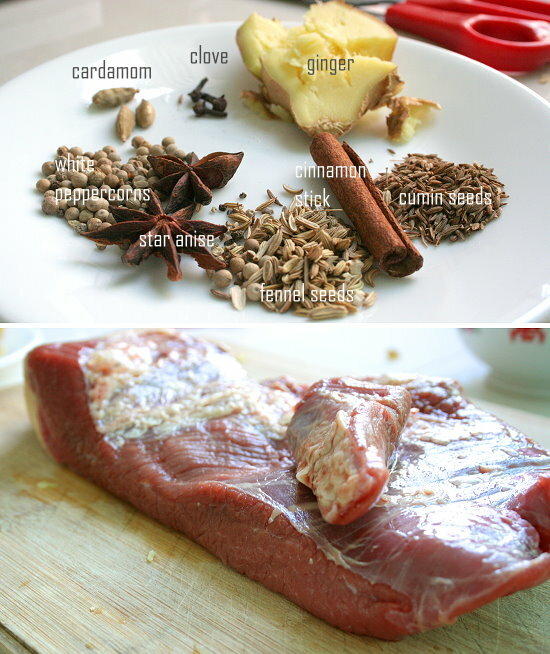 I love cumin… and I have my own spices. 1. Boil everything for 3-4 hours until the meat is easily penetrable when poked with a chopstick or fork. Fish out the beef and strain the broth. 2. Let the beef cool down and slice into thin slices. 3. Extra broth can be seasoned and be served as soup later with a sprinkling of Chinese parsley (daun sup). 1. Wash rice and drip dry in colander. 2. Heat wok on medium heat. Put in butter and when it has melted put in garlic , onion, cinnamon stick and cardamom. Saute until very fragrant. Put in kurma spice and stir. Put in rice, salt and tomato paste and toss until well combined. 3. Put the seasoned rice into rice cooker and put in beef broth. Let the rice cook until bubbling subsides. 4. Pour the evaporated milk evenly over the rice, lightly stir it,level the rice and let it cook until done. 5. Let the rice sit for at least half an hour (best is 1 hour) after the cooking stops(power off). Fluff rice with chopstick and serve. 6. 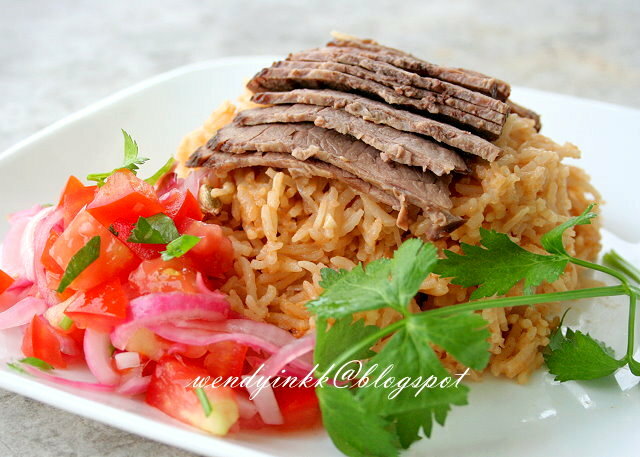 You can either mix in the beef slices or serve rice with beef separately. Serve this with air asam tomato as a side dish. *I actually microwaved my rice. I poured boiling broth over the rice and zapped for 7 mins. Let it rest for 10 mins, Pour in the milk, stir and zapped for another 7 mins. Rest the rice for 30 mins before fluffing. Delicious...especially the tomato! Very appetizing! thanks for the recipe. dah lama nak makan nasi ni! finally, with this recipe, I can make it myself! thanks again! do join us for the event, so far none from u, hehehehe. Kalo dah masak, jom join MFF bulan ni! I bet the wait was worth it- I can see how tender the beef is..and the flavoured would have sip in! You are right, it does look easy- just need the patience. i have not try the daging before but believe the tomato rice is very appetizing, should be good match to go with the daging. this sounds like very beef-y but i really dun mind tasting it!but i can sapu all the air asam tomato! wendy...akak ada masak asam laksa lama dulu tapi takder FB, then how? I want to replace beef...use chicken or pork better? Yeah, just need to allocate enough time to simmer the beef. Haha, it's quite rich lor, cannot eat too much, haha! The tomato paste is just to enhance the rice, it's not really a nasi tomato, as one can't taste the tomatoes much. ambil ambil la..... gua kasi lu itu sumua asam tomato. La, bukak je la FB, hahah. Laksa Utara ada beza skit ngan assam laksa kat Penang. Takda pakai petis. Kalo post lama, sorry la, hanya kat FB. If u replace the beef, then no more nasi daging. But if u want to cook just to taste, I suggest you mix mutton and pork. Mutton for the smell and pork to bluff urself u're eating beef. Chicken dun look like it leh, hahaha!